Everybody please welcome My Town : ICEME Amusement park. Come say hello to our new Penguin mascot. Are YOU brave enough to ride a BIG roller coaster? 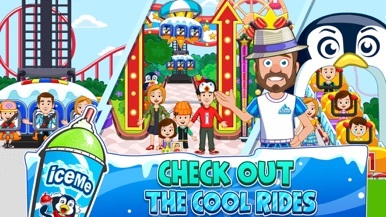 Find out in the all new ICEME Amusement Park! And don’t worry - like all my town games our characters have emotions, so even dad gets scared and cries on some of the amusement park scary rides. 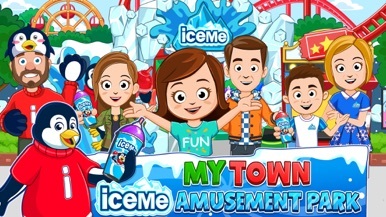 My Town : ICEME Amusement Park is the latest dollhouse game by My Town. There are all kinds of fun adventures to had as you explore the park and try out rides like the Slingshot, the Parachuter and more! When you need to take a break, you can visit the ICEME store to pick up souvenir bags and drink a tasty ICEME in a cup you can take home with you! Then you can bring your ICEME to one of the food stands to pick up a snack. 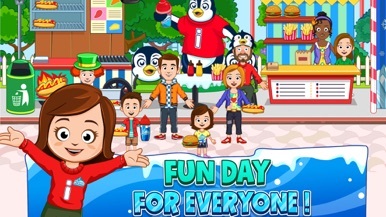 And don’t forget, amusement parks are always more fun with friends, so if you have more than one My Town game, you can bring ALL your favorite My Town friends to the park with you! 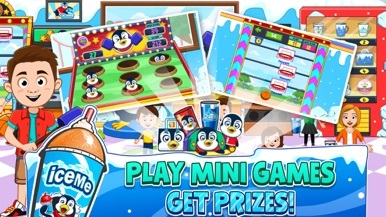 - New Characters – If you have any of the My Town dollhouse games, you can bring your characters from those games over to My Town : ICEME Amusement Park to join you on your travels! A great little epic war was broke out, hero, picked up the sword in your hand, to defend your homeland!! Every one likes beautiful girls, but the evil witch Normal University uses a magic change has become a surname because shell beauty. Dont lose heart, we had amazing Spa, fully furnished apartments in magic, and let girls promote a surname change back to beautiful women!